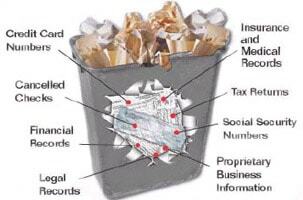 A professional paper shredding program can help you be in compliance with the various State and Federal Laws. These laws mandate that you protect the private information of your employees, customers and patients. In order to be compliant with the various state and federal laws and protect yourself, stockholders, employees, and customers/patients, you should destroy all confidential and outdated material. Shred any document which could be used for the purpose of identity theft (social security numbers, customer lists, credit applications, tax returns, etc). Shred any document which is mandated to be protected by privacy laws such as HIPAA (health care), GLB (financial) or FACTA (general). Shred any papers which could cause harm to you or others in the hands of criminals. Click here to see many examples of documents which should be routinely shredded.